In my last post, I wrote about how to use conferences and trade shows as a source of business intelligence. Last week, I attended the FocusOn Learning 2017 conference in San Diego, a well-run event hosted by the eLearning Guild. 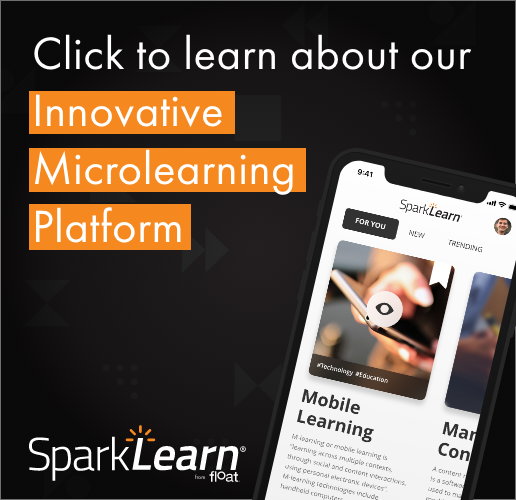 I was especially interested in where Float’s new microlearning platform, SparkLearn, fit into the mix of products, content and services on offer in the exhibit area. So what did I learn at the conference last week? Exhibitors can be divided into two broad categories: those that offer comprehensive platforms, and those who try to focus on specific parts of the elearning development and delivery process. At the beginning of an industry such as elearning, most vendors offer tools and templates for various parts of elearning production. As an industry matures, more end-to-end multi-featured platforms are on offer, as the established companies in the space incorporate the best individual tools into their programs. But, many enterprises have already heavily invested in tools and early elearning platforms, and would like to continue to get a return on their investments. The reality is that many companies have a unique mix of software and hardware used by the learning and development department, and fill in the gaps with additional tools and/or custom services. It is important to note trends in elearning that were not represented by the exhibitors, and what has disappeared from previous years. Often topics show up in presentations before they become products offered by vendors. For example, augmented reality, xAPI, data analytics, and 3600 video were all topics in conference sessions and at Demofest, but were not prominent in offerings by vendors. Interestingly, mobile learning was not a hot topic among exhibitors compared with previous years. It seems to be simply taken for granted that everything needs to be designed for mobile devices. Maestro promoted its mobile learning strategy and design capabilities, the starting points of the elearning development process. Other exhibitors that offered their expert services included Designing Digitally, Float, Reflection Software, The Game Agency, Sealworks, and Yukon Learning. Engagement techniques were the focus of several companies in the hall, including GoAnimate, HapYak, Indusgeeks, and PitchVantage. The assumption is that by using one of these technologies, learners will be more engaged. Specific content for elearning was displayed by ProSell and the eLearning Brothers. Prosell has a ready to go onboarding program while the brothers have templates and ready-made and customizable content. Content and software for assessments was shown by Questionmark. Translation and localization services were offered by PTI Global and VideoLocalize. PTI requires that you send them all your content for translation, while VideoLocalize translates video in seconds on the fly. Each year there are more vendors that allow L&D staff to pull the entire elearning production, publishing and delivery process together within a single full featured platform. At FocusOn Learning 2017 these included gomo, Impelsys, Intuition, Leo, Riptide, RISC, OnPoint, and TokBox. Float is uniquely positioned as it offers both custom application development services and an affordable microlearning platform. Sparklearn, which was launched at the conference, pulls together a large number of authoring, publishing and analytics tools, making it possible to have a comprehensive end-to-end platform without giving up the investments in these products that a firm has already made. For a demo or more information, please contact us.